Katwijk, Netherlands: Lately there has been much to do about Trump’s policies regarding refugee children, that separates children from their parents and puts them into prison. This policy is outrageous. But refugee children in the Netherlands get treated heartless and cruel by the authorities too. And like in the United States, this is a deliberate policy. 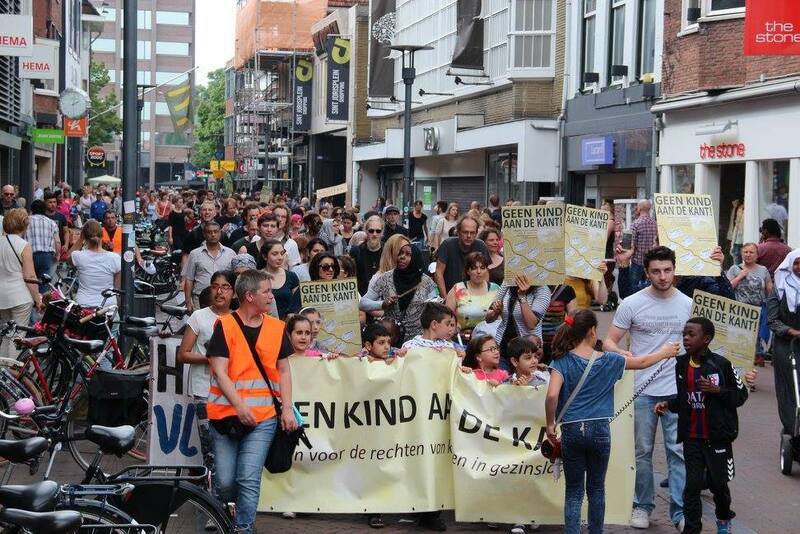 To draw attention to the situation of refugee children, Geen Kind aan de Kant (No Child on the Side) organizes a demonstration in Katwijk on the 29th of September. Some one thousand refugee children are living with their parents in so called ‘family locations.’ The facilities in these family locations are harsh: very small rooms, very low living money, inadequate medical help, strict rules and absurd fines wherein families regularly get cut on their living money. The police regularly raids the family locations early in the morning to transfer families to the family prison in Camp Zeist, the last stage before deportation. In this way children grow up in a constant fear to get deported to a country that they barely know or don’t know at all. On top of that, families regularly get transferred to other family locations. The Netherlands has thus developed an inhumane policy for refugee children that violates the Convention on the Rights of the Child on a daily basis. To draw attention to the situation of refugee children, No Child on the Side is organizing a demonstration in Katwijk on the 29th of September. With this demonstration we want to fight for a just treatment of refugee children and put an end to police raids and the subsequent deportations. We demand an unconditional Children’s Pardon, so that refugee children no longer get torn from the life here in the Netherlands, that they’ve build with so much effort. Above all we want to support families that are living in ‘family locations’ and show them that they are not alone in their struggle. Today two people of the Enough is Enough team will join the Cars of Hope collective in Bosnia to work together with refugees to provide mutual aid and to produce independent border monitoring reports from the Bosnian/Croatian border. Read the reports of our last stay in Bosnia: here.